I’ve been a fan of the Hi-Tec-C pen explosion recently on Kickstarter. I have backed several of these pens with great results in each one. As much as I love using these type of pens, one of my favorite types of pens to use are felt-tip pens. Sharpie pens, Sakura Microns, and Pilot Fineliners are among these type of pens that I like to use. I like to classify them as hybrid pens since they are perfect for both writing and sketching. It’s a pen type that produces a bold dark stroke every single time. After seeing all the pens on Kickstarter, I wanted a felt-tip pen enclosed in aluminum or a more permanent body specifically made for these types of pens. Once again I turned to Kickstarter and Minimal Duck which answered my wish with a project named X-pen. The X-pen is a felt-tip aluminum body that is compatible with both the Pilot Razor and Pilot Fineliner felt-tip pens. To say that this was right in my wheelhouse is a complete and total understatement. It’s probably the fastest I’ve backed a project on Kickstarter when I found it. The X-pen is a streamline wonder when I picked it up to hold. 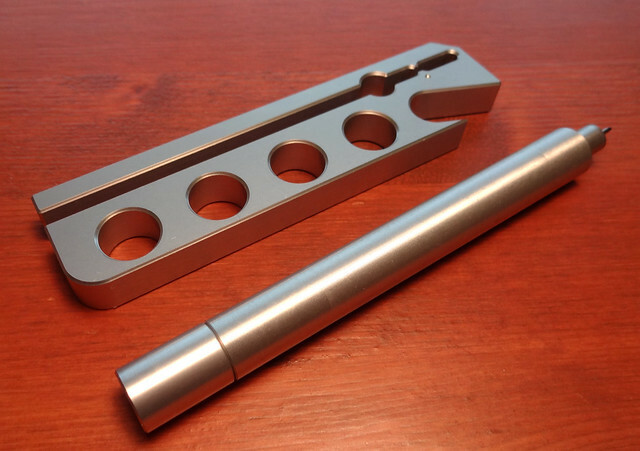 There were two versions of the pen that could be backed: a clear anodized finish or a electroless nickel finish. I went ahead and backed the clear anodized pen which showed off a nice clean finish. The anodized clear finish is not completely smooth as the body contains thin small rings based on how it was cut that make up the surface of the pen. These rings form small grooves to provide an ideal grip for the X-pen. It’s a subtle way to provide a grip without it being too noticeable. The weight of the X-pen is spot on perfect; enough weight to feel the quality but not enough to make it too heavy to use. Its ideal to write with without significant hand fatigue. The total length for the X-pen is just 4 inches which makes it great for pockets. The cap is also unique because it is attached to the X-pen with a strong magnet. I had some reservations about the strength of the magnet until I tried to remove the cap. Needless to say, the cap will not come off in a pocket without directly removing it yourself. When in use, the cap can either be set aside or you can post it on the back of the pen which is also attached by the magnet. The process of installing the refill is aided by the design of the X-pen itself. The bottom of the pen contains a small hex set screw that needs to be removed to access the ink cartridge. The X-pen cap contains a hex head on the top that can be used to unscrew the hex set on the bottom of the pen to remove the ink cartridge. The existing cartridge can be slightly difficult to remove but you can simply tap on the bottom of the pen to loosen the tube enough to pull out. The X-pen can accept both Pilot Razor and Fineliner felt-tip pens which can be found in most office and art supply stores. Most pens just require a refill to install in the pen. The X-pen requires both the pen tip and ink cartridge from the standard plastic body to transfer to the X-pen. 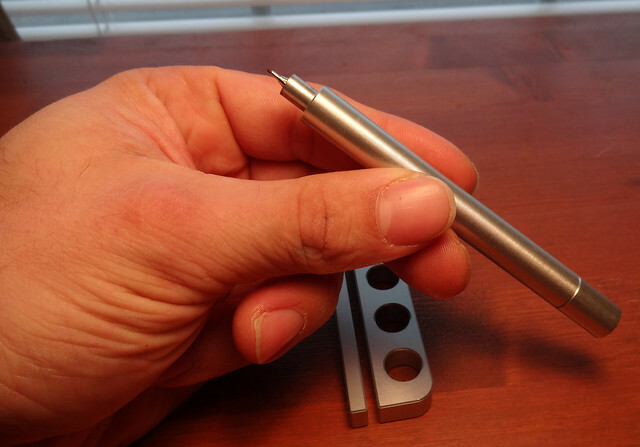 This install can be performed two ways; either with a pair of needle nosed pilers or using the pen tool that could be additionally backed with the X-pen. 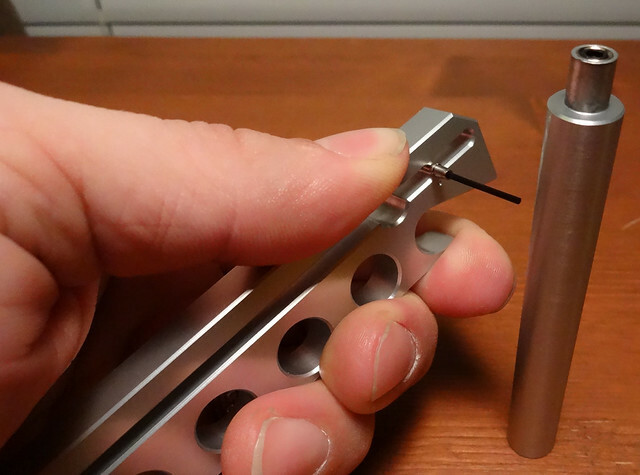 One side of the pen tool is used to remove the tip and cartridge from the Fineliner and the other side is for the Razor. The pen tool not only serves as a tool to remove the tip and cartridge, but it also can be used as a business card stand and bottle opener. Despite the many positive features of the X-pen, there are also a couple of drawbacks here as well. The main problem with the pen is when you post the cap. The cap is not very securely held on the back of the pen. The cap is only being held on by the hex screw head on the top of the cap. The magnetic strength is decreased with only this surface area of the hex screw head being used. This causes the cap to shake and rattle when moved very quickly. This isn’t an apparent issue if you are simply writing and sketching but if you move very quickly, you could shake the cap loose if you're not paying attention. Then there are those that prefer not to post caps which wouldn’t be an issue except for one minor problem. 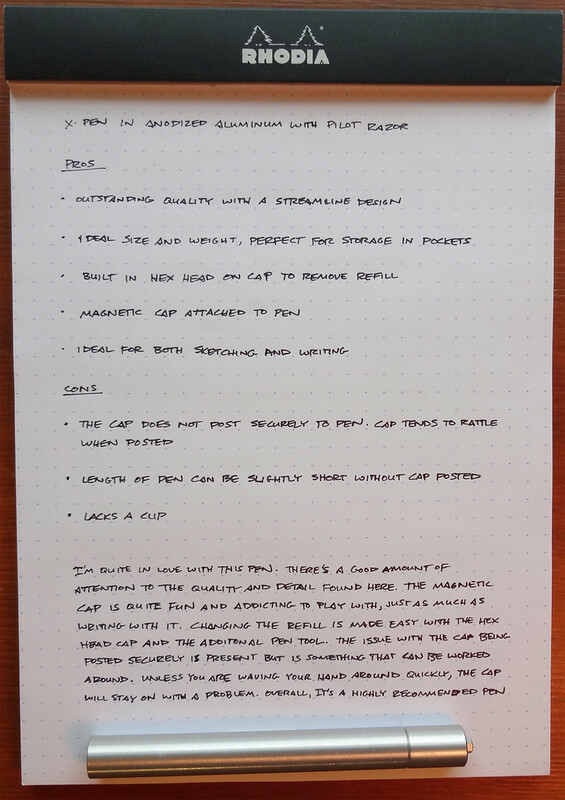 When the cap is posted, the pen rests at an ideal position on the cusp of your hand. Without the cap, the pen seems a little short especially if you have larger hands. I almost wish there was a way to screw the cap on the back of the pen. This would assure the cap would never fall off when posted and the length would be ideal for everyone to use. Despite this problem, the X-pen is a stunning aluminum body to use with a Fineliner or Razor. The quality is top notch and the magnetic cap is fun to play with. The nice portable size is convenient to fit comfortably in your pocket without taking up too much space. This is really for anyone that prefers to use felt-tip pens on a daily basis. This is something that I have been looking for as a permanent way to carry my felt-tip pen that will last a lifetime. It takes an existing product and makes it much more than it was before which can be shared and passed down to future generations. I would like to thank Arash and Mehdi Malek of Minimal Duck for making such a stunning aluminum enclosure for the Razor and Fineliner pens. I look forward to any projects they plan to release in the future. Posted on March 6, 2013 by Brad Dowdy and filed under Guest Post, Pen Reviews, X-pen.